Re: New Zealand [4.8.12] V17-P14 GFX? thanks for comments isaiah40...is this better. Re: Re: New Zealand [4.8.12] V17-P14 GFX? thehippo8 wrote: When can we play it? I think I've run out of critiques, and you'll probably need some fresh eyes to help further. Best of luck! AndyDufresne wrote: I think I've run out of critiques, and you'll probably need some fresh eyes to help further. Best of luck! I agree, any further improvement is likely to happen in final forge ...all a bit ethereal until then! If anyone wants to know, this is how cairns did it. I don't know if it is me or just possibly the color combination. But do the mountains in the North section of the lower island look a bit off. Specifically the ones that border Picton. I get the feeling that they are pyramids rather than mountains, but it could also be the color combination as well since I really can't see the extra detail in the ridges (as shown in the boarders between the bonus's of West Coast and South Canterbury). It might also occur in the Southland bonus. I didn't have any issue with them when I first looked at the map but after I saw that in the other location it kinda looks like the same thing happened. I like the look and overall feel of the map and looking forward to playing it. 1. The mountains could do with some white Snow caps to make them stand out more. Especially the Southern Island around "Queenstown" as it is renowned for its Snow. Please note you have it as "Queentown" on the map bottom right. Anyway that's my pennies worth. I don't know...the backdrop seems kind of flat to me...maybe a center to edge gradient from the map? 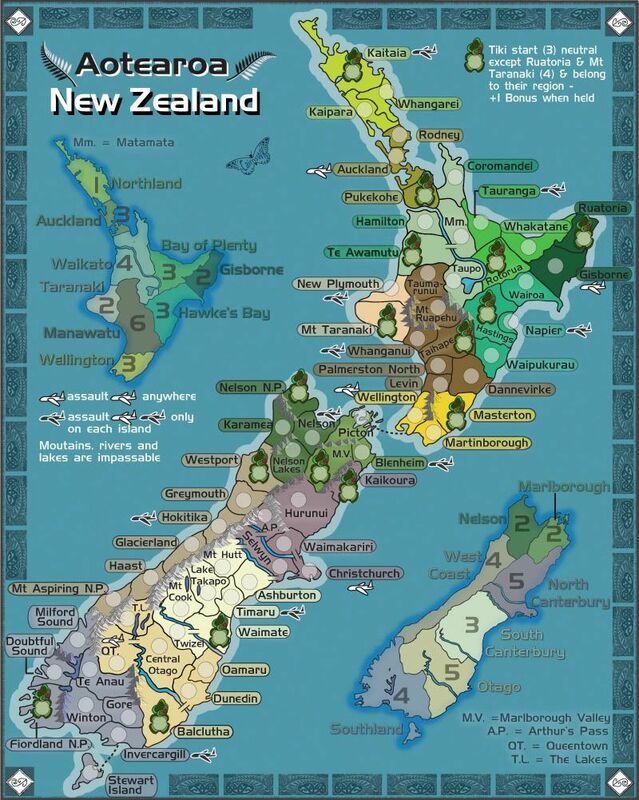 As a new zealander, awesome. Re: New Zealand [4.8.12] V17-P15 GFX? Last edited by cairnswk on Wed Aug 15, 2012 5:16 pm, edited 1 time in total. skillfusniper33 wrote: I don't know if it is me or just possibly the color combination. But do the mountains in the North section of the lower island look a bit off. Specifically the ones that border Picton. I get the feeling that they are pyramids rather than mountains, but it could also be the color combination as well since I really can't see the extra detail in the ridges (as shown in the boarders between the bonus's of West Coast and South Canterbury). yes those mountains do look like pyramids and it has partly to do with the colouring, but i have altered their shape now in V18, and also the ones in Southland. nudge wrote: I like the look and overall feel of the map and looking forward to playing it. As to the ocean, i have also redone the areas around the mini-map and added your kiwi in the background. Last edited by cairnswk on Wed Aug 15, 2012 5:10 pm, edited 1 time in total. rdsrds2120 wrote: I don't know...the backdrop seems kind of flat to me...maybe a center to edge gradient from the map? rdsrds2120, thanks also for your opinion. i do realise the ocean is a bit flat, and have experimented several times now with some kind of gradient, but i seem to always get the wrong thing and don't like it. a radial gradient from the centre makes it look like someone has shone a great big light on it and it si quiet distracting. For now, i'll leave it as is but if someone else should mention it, i'll have another go later. Re: New Zealand [16.8] V18-P15 GFX? So here is version 18 with the changes mentioned above. I think the flat back is a good fit for the map to be honest. Re: Re: New Zealand [16.8.12] V18-P15 GFX? Re: New Zealand [16.8.12] V18-P15 GFX? Can you do these mountains the same way you did the ones above them? isaiah40 wrote: Can you do these mountains the same way you did the ones above them? The ones on the north side of Nelson Lakes. as were the ones on the north side of M.V. and the ones between Karamea and Nelson N.P. yoy're not meening da ones on da sout' side of Nelson Loikes are ye?